As I said in a recent post I went on this new tour, A Matter of Taste: Ceramics and Culinary Connections at the Koerner Ceramic Gallery at the Museum of Anthropology. A recent addition to the tours at the Museum, it was led by a docent, Arlee and first of all she talked about Walter C. Koerner, his connection as a benefactor to the university and the museum. I was familiar with the late Mr Koerner as I saw him on occasion over the years at various university functions and for the last 18 years of my pharmacy career I went to work in the Koerner Pavilion, which was the Acute Care building of the hospital at the University. The ceramics housed at the museum were Mr Koerner’s personal collections, which started when he was a young boy in his native land, formerly Moravia but later part of Czechoslovakia. and there are over 600 pieces covering the period from 1500 to 1900. It was decided that instead of just talking about the bald facts known of the objects this tour should highlight the social history of some of the items, namely those related to food. So Arlee began to talk about food habits and how they reflect the times and fit with the cultural context. In no way was this talk exhaustive and I report it just as it occurred. In the Middle Ages and beyond, food was medicine and medicine was food. Medical practice often consisted of trying to balance in the body, often by means of diet, the four humours which are shown in the chart below from this article. So the first ceramics we looked at were apothecary jars of different types. 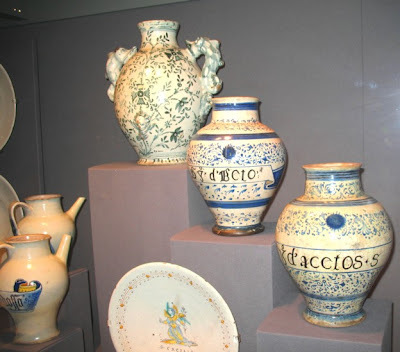 All were made of tin-glazed earthenware and depending where they originated they were called faience, majolica or deftware. Some of the jars were actually for liquids and had spouts for pouring while others were for dry ingredients or salves. 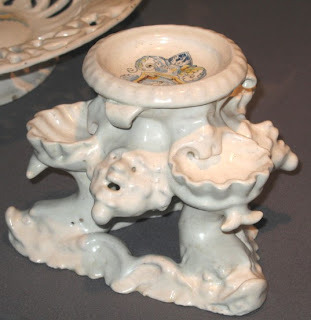 Some had the names of the contents incorporated into the design of the glaze. Usually the glaze was white to duplicate china which was very rare and expensive and often the decoration had an Eastern flavour. As an aside, apothecary jars are still produced today as decorative accessories for pharmacies and homes. Most of the ones I have seen in pharmacies over my career were made of glass which of course does not protect the contents from light so these earthenware ones were superior in that aspect. 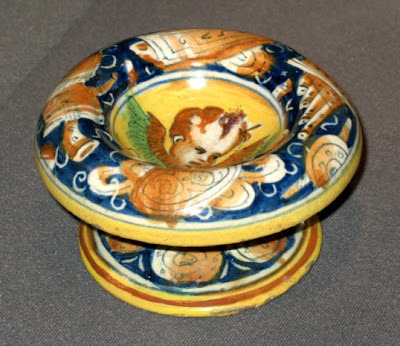 There were several attractive salt dishes or salt cellars in the collection and this one was quite charming. Because salt was so expensive the actual container part for the salt is small but the overall dish is large and ornate to represent the importance of salt. Because salt was obtained from the sea as well as mines the decorative images on the cellar were often images or fish or sea gods. 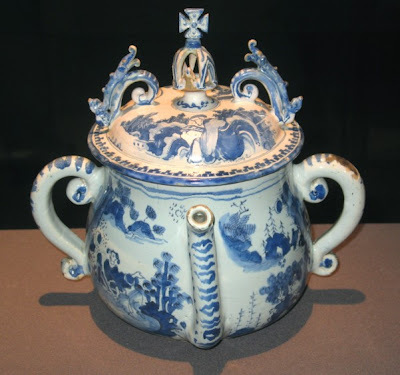 During the Middle Ages when salt was a valuable commodity, salt would be kept on the table in elaborate metal or glass dishes as a status symbol. Last year I read an interesting 400 plus page book called Salt: a world history, by Mark Kurlansky which certainly told me more than I ever wanted to know on this topic. Unfortunately it was a bit tedious at times but I still enjoyed it on the whole. I think most people know that the word salary is derived from the days when people were paid for work in salt and of course to sit above or below the salt designated one’s importance to the host. These two facts were the only two related on this tour. Next time we’ll look at a few tankards. As I said snippets of fact were dropped rather randomly on this tour and I apologize for the fact that they are a bit disorganized and not at all comprehensive. They did provide a suggested reading list both on ceramics and food related topics and there is always google.